I began a reading of "Artemis Fowl". RS said it reminds her of the strangely non-sexual, intense relationship between Lucky and Nrsc. I read to "Ciao, fulletta" in Chapter 3 ("Holly") and by the end of page 61 (The Hummingbird Full Moon Rirual) was too much for me. The time was 1922hrs, I dressed, secured S15 and caught the OL for lemon Grove. I spent the evening and early morning (16 April) in the garage of the Blue Bird Street house mostly doing some non-LEPrecon inter net surfing. The most recent meeting of The Honey Bee Writing Club is scheduled for 1500hrs in The MVL. I thought yesterday it was an ACC meeting. Wrong, it is to be The HBW Club. I cannot even begin to gues what the meeting shall accomplish. RS and I are not in the Club. Beth G is taking care of her little girl plus Dsrvl`s three children. We do not expect her to come, unless Charlene agrees to help. Aldous for unknown reasons is with CFS and Speadtle somewhere near Palomar Mountain. I've been member of this community for quite time, and now I need some advise. Question is how do I devide given circle with radius R into N vertical segments with same area? And by vertical I mean that devising lines should be parralell to the diametr line of that circle. One more thing - N is always even. 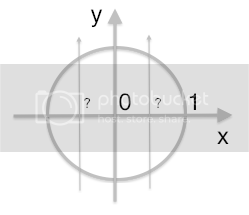 Simple example is N = 2 : and we have circle divided vertically into two parts of equal area with deametr line. I need this to speedup my litlle research on mathematical statistics with parallel GPU eval. Any help In form of formula, or ref to the known algorithm (if it does exists) or some code on almost any programming language would be g8. Illustration added. Case: R=1 N=6, areas of all segments are equal. I need to know OX points marked with question marks. Flash animations on webpages consume a surprisingly large amount of CPU time, especially if you keep many pages open at once. When you think about it, this is a very fast and efficient way to distribute some software onto a lot of computers. Put up a banner on a major news site and you have your code ticking along on thousands of computers within minutes, and with no user interaction. It's strange that distributed computing has not leapt onto this. Granted, it's a narrow nieche, with the program running only for a few minutes and with a limited size, but there are still plenty of cases where it could work. I've only found This proof of concept of distributed flash computing. This example require some user interaction and fills a whole screen, but there seems to be no reason why it couldn't run as a banner ad. Why isn't this more widespread? Do you know if there exists any keystream algorithms where in which, given an input key, you can request from the algorithm something like "give me slot 433"? so a typical keystream you seed with some key and then are able to request sequential bytes. In my particular application I want to encrypt 8Kbytes xored against a keystream but have it so it can be randomly read and written to. So I guess it would be like a key-block cipher or something like that. I don't fancy re-implementing crypto so I'm wondering if such a technique exists out there. At the moment I am looking for a job of java team lead / system architect. I'm in the middle of writing a connector to some accounting software and I've been implementing a lazy loading list of proxies because I'm dealing with huge lists of items which load slowly (even the item id s load slowly). return null; //TODO halp pls! notthebuddha @ 5:48am: Big-O for other parameters? Is Big-O (and Omega and Theta) ever used for other algorithm cost parameters besides time? Like, could I usefully describe different presentation methodologies in terms of bandwidth consumption per n bytes of content as O (n log n) for example? Or is there a separate notation? triprc @ 3:48pm: I'm sorry allow me to rephrase this. If I'm graphing e^x is there a point when y will have a zero value? triprc @ 3:33pm: What exponent must e be raised to in order to equal zero? I’m hoping someone here might know why this is not working as expected. I’m attempting to generate pseudo-random throws of dice in Java. In each round I generate 15 values from 1 to 6. From the player’s perspective, 5 dice are rolled, and any or all of them may be re-rolled one or twice. I implement this by taking the first roll from the first 5 values, whichever dice are not held on the first re-roll from the corresponding 6th to 10th values, and whichever are not held on the second re-roll from the 11th to 15th values. I became suspicious that something was not right, and I believe I have shown that to be so. I’ve tried two sources of random numbers: one is the Random class built into Java (which is a linear congruential generator); the other is an implementation of the Mersenne twister. Both exhibit the same anomalies, so I presume the fault must lie in the routine that reduces the range to six integers, which is common to both. ( Collapse ) I previously tested the frequencies of each number — they are as expected; but there seems to be correlation between values in certain positions in the 15-number groups I’m generating, and I don’t know why, nor how to go about eliminating it. Any insight and/or advice would be greatly appreciated. Some backstory for those willing to kindly help me interpret the below java code. The class is Computer Graphics. What we did in the class was to basically reinvent the wheel; well, the java Graphics2D and Graphics3D API (except... badly) In our projects we managed to master (dun dun DUN!) 3D cubes and viewpoints, hidden surfaces, shaded surfaces and hidden line removal (ta da!) and an insane amount of inheritance. For this question we have to discuss how we might represent a class to represent a cylinder using flat surfaces (where Surface3D inherits from many simple classes: Drawing3D, Line3D to Point3D) to approximate to the figure. So far I have established that the paramaters used to specify the cylinder will be: center point, diameter, length and position. An ArrayList data structure will be appropriate for the cylinder and how I will do the class in English. I had a look at the sample answer and I found some java code which I've since been puzzling over because I'm not 100% sure what on earth it's doing. main_framer @ 12:27am: Новое ЖЖ сообщество / New LJ community. I am coloring a graph's nodes, based on a set of initial conditions and rules of the form "if colors of a node's neighbours are like this, then color of the node is that": so, a cellular automaton on the graph. For simplicity, let us consider the graph to be acyclic and restrict the rules so that a node's color depends only on the colors of its child nodes. What are the methods of exploring convergence and soundness of such a system of rules? To put it easier, how to know, for a given system of rules, whether there exists a unique coloring satisfying them, and whether it is reachable by the following algorithm: "take any node, apply rules to it, repeat until convergence"? Almost ever since I got acquainted with category theory it seemed to me like a perfect tool for formalizing database queries and their properties, and, consequently, for building optimization frameworks. I am considering this for my thesis, but I can't find any work about applying category theory to query optimization, and this frightens me a bit: looks like someone has long ago proved that this is impossible (why would it be? ), and now noone even tries. Could you give me pointers to some works on the topic? I've googled the hell out of the internet, I found some works on formalizing data models with CT but nothing on exactly optimization. So, I'm once again writing a ray-tracer. So far the only objects it supports are planes and spheres. My intent to support only polygons. So, I'm curious. A low-polygon polygonal object is going to look, pretty.. well- polygony (if you know what I mean). My plan was to take the ray-polygon intersections and blur the collision normal, depth (somehow) and other information between adjacent polygons. I was planing on doing this using the dot-product between the collision-to-adjacent-polygons-far-edge vector and the collision-to-adjacent-polygons-near-edge vector as a bias for bluring. Is this how smoothing polygon-meshes is normally done? It seems like there'd be a better solution. What do you people think? So this is kinda a simple technique that I think is pretty cool. For ever vertex find the vectors to it's neighbors and subtract the distance that should be between them, multiply by some small constant. Sum all them up and add it to the vertex. Rinse and repeat. I've stored it as an animated gif, it's about 3Mbytes so give it a second to download. I have two vertices that are going crazy with randomness. I think it looks creepy myself. Thank you all for your help to my previous post! I've started to pick up C syntax really quickly since, and I've been integrating my two programs; the one with the functions to push, pop and create arrays, with the program lightning_rose suggested that I should write. So far my array seems to work and I'm sure that my push function is working, but when I ask it to print the contents of the stack, it prints 0. My aim isn't to iterate down the entire array, but to print that they've been pushed once they've been pushed. Push 2 on the stack. Push 1 onto the stack. Meet operator, pop two and then push answer onto the stack. The link in the previous post is a Trojan website that will attempt to install a virus on your computer. ginaspider @ 4:27pm: Anyone know of a good algorithm to find the border around a 2d polygon mesh? Can anyone recommend a good beginners book on C? Edit: I ended up buying "C in a Nutshell" because it is the course textbook and came highly recommended. It doesn't provide enough baby-step explanations for me, though, so I'm still finding C a damned difficult language to learn. Thank you all for your suggestions, I'm planning on buying the recommended book anyway in the hope that the developers of C will be better at explaining things.